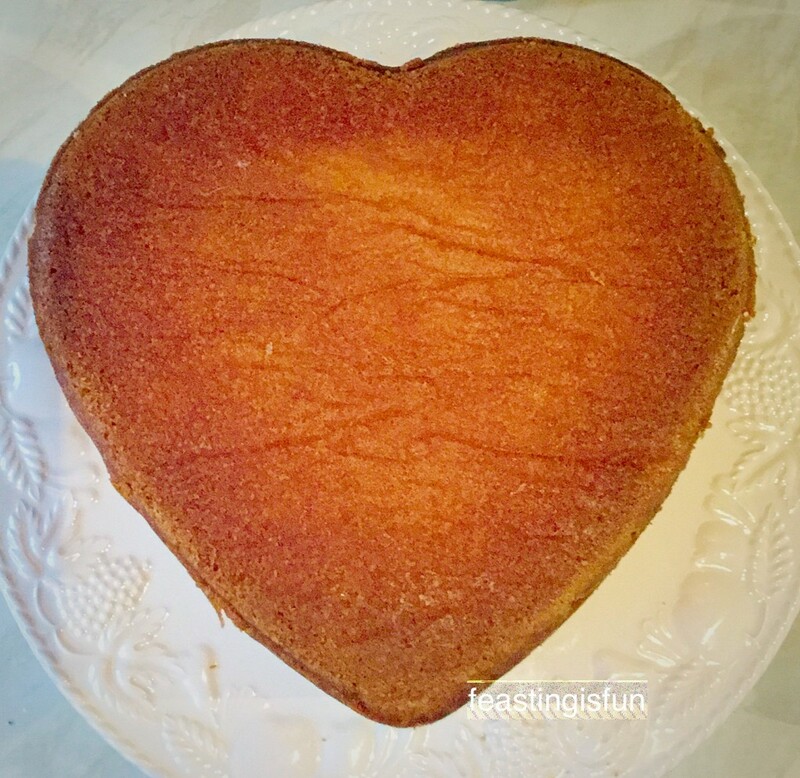 I baked this Strawberry Sweetheart Cake for my wonderful Hubby, on Valentine’s Day. Vanilla flavoured sponge, split in two with a slathering of strawberry jam in the middle, sealed with buttercream roses. 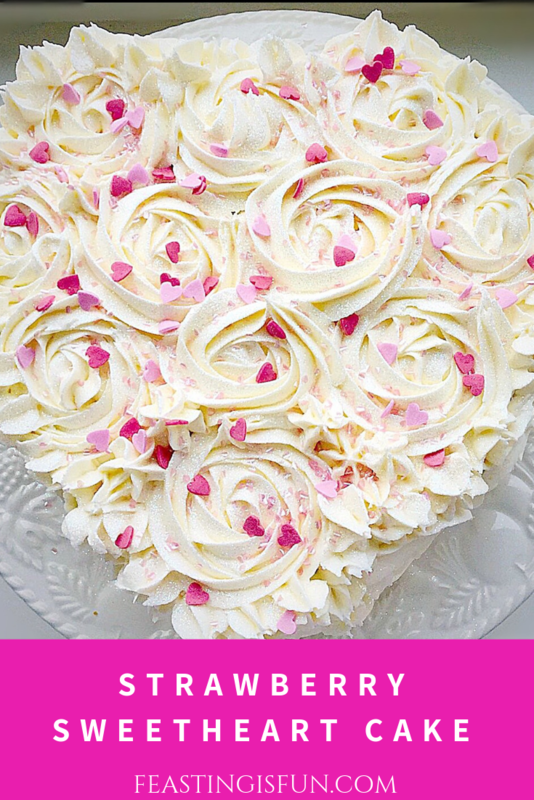 Because is a there a better way to say those three precious words ‘I Love You’ than with cake? 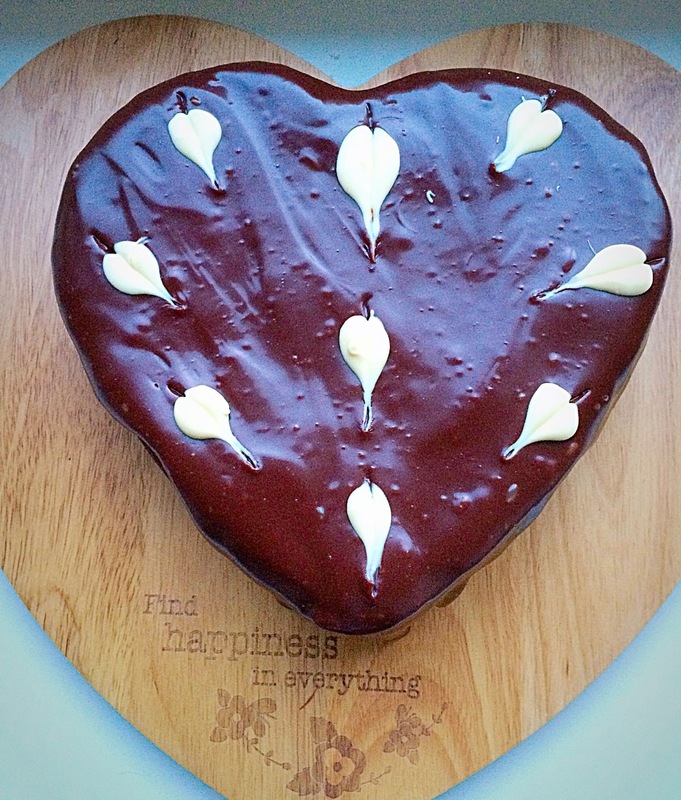 Since I’ve baked and created a few chocolate recipes for Valentine’s Day like Chocolate Heart Cookies, and Chocolate Fudge Brownie Bites which are utterly delicious, for the day itself I wanted to bake a cake with simple flavours. 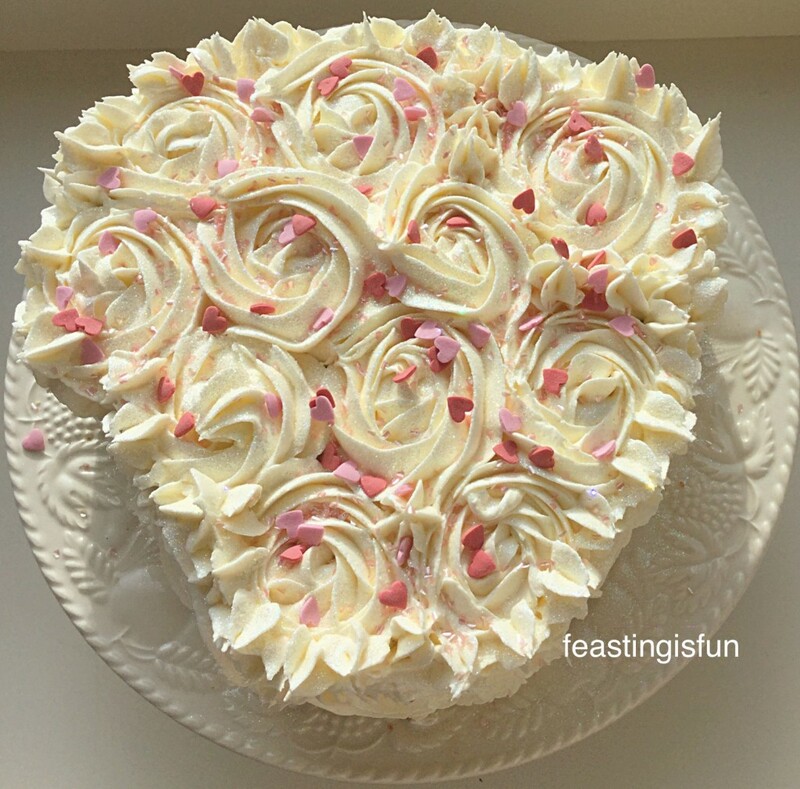 Sugar and Crumbs sell are range of naturally flavoured icing sugars and I used the Strawberry Milkshake to make the buttercream that decorates this cake. The taste is truly like strawberry milkshake and makes this cake absolutely sing on your tastebuds. Alternatively you can use plain icing sugar and flavour it. Foodie Flavours sell a great range of natural food flavourings. 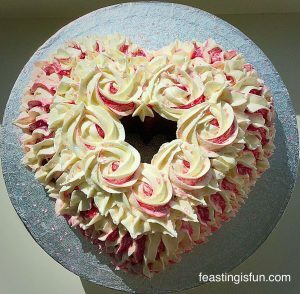 Strawberry Sweetheart Cake swirled with roses and sprinkled with love. 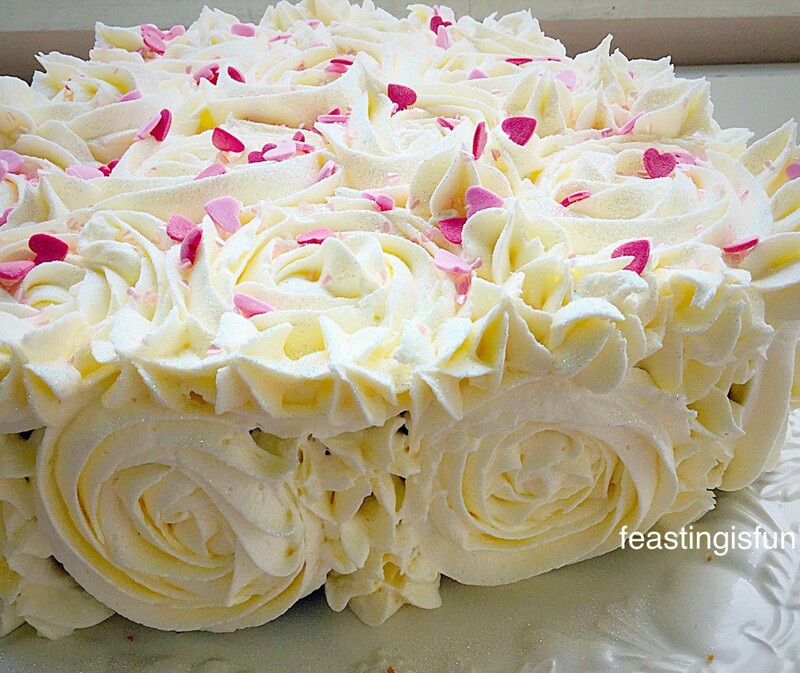 Rather than cover the cake with a smooth layer of buttercream I chose to pipe roses over it. Therefore, as I am not a trained cake decorator, I promise that the piped roses are not difficult. Because if I, with my wobbly hands can pipe them, you can too. The effect of the roses gives this Strawberry Sweetheart Cake a very professional finish – only you and I will know how easy it really is. First of all fit a large star tip (I used a Wilton 1M piping tip) to your piping bag and fill with the buttercream. Practice on a clean plate first. Imagine writing the letter e, when you get to the end of the e you contine round in a complete circle. It is that easy!! 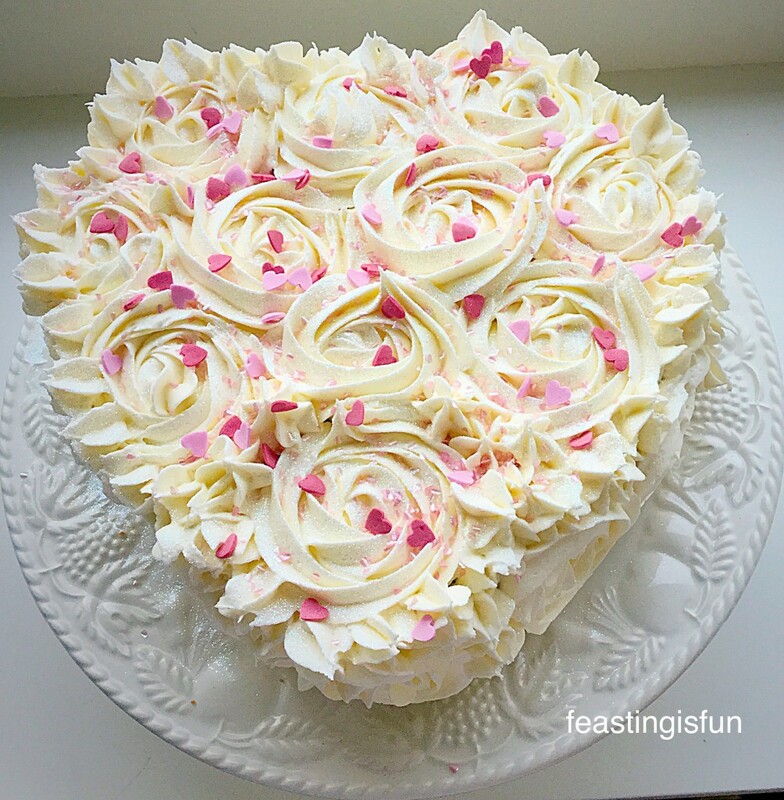 A few practices, keeping the pressure on your piping bag steady and you will have piped roses! This cake is only the second time I have piped these roses! The first time was these Raspberry Ripple Almond Cupcakes. Strawberry Sweetheart Cake roses piped around the sides. I will admit that piping the roses around the sides was a bit harder. So I piped either side of the heart first and once I’d got the hang of it piped the final rose on the point of the heart. 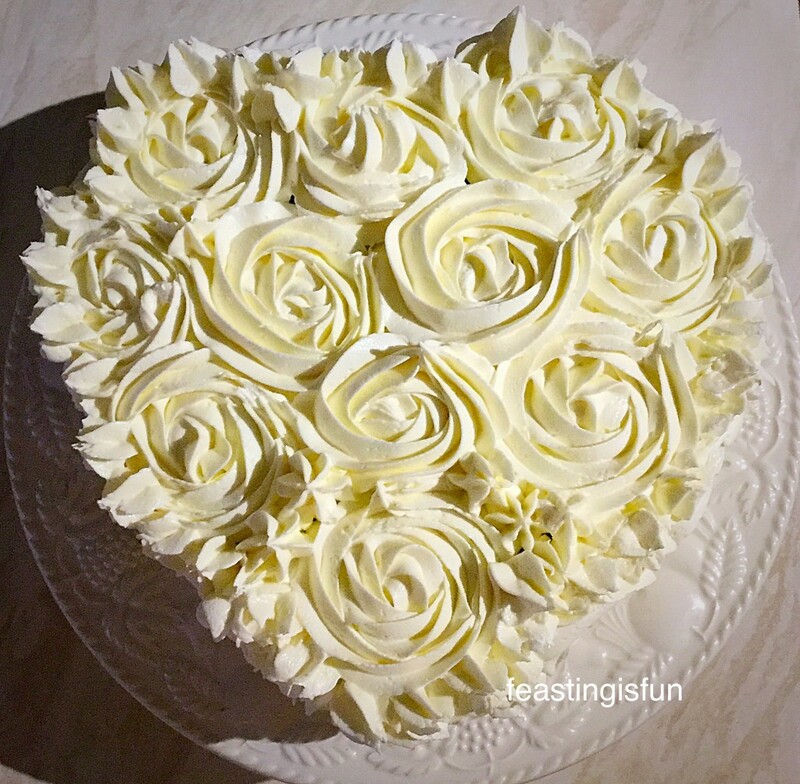 Using the same tip, I piped little stars in between the roses to fill in any gaps and then defined the heart by piping stars all the way around the top edge. Strawberry Sweetheart Cake a view of the side – using piped stars to fill in any gaps. Glitter, shiny hearts and more heart sprinkles finished this cake off beautifully. At least that’s what my hubby thought and this cake was made especially for him! Baking for my family, as I’ve mentioned before, is one way I like to show them my love. This past year has been very hard on us all, due to my seizures (see here). Especially my hubby, who has looked after not only me, but our three gorgeous children, as well as holding down a demanding, full time job. Wanting to show my love for him on this particular day was very important to me and as a family, we all get to eat the cake, my way of saying thank you and I Love You all. 250g/9oz Unsalted Butter – at room temp. 500g/1lb 2oz Strawberry Milkshake Icing Sugar – or alternatively use plain icing sugar and add your own flavouring to taste. Method: Preheat the oven to 160C/140C fan – this cake is cooked low and slow. 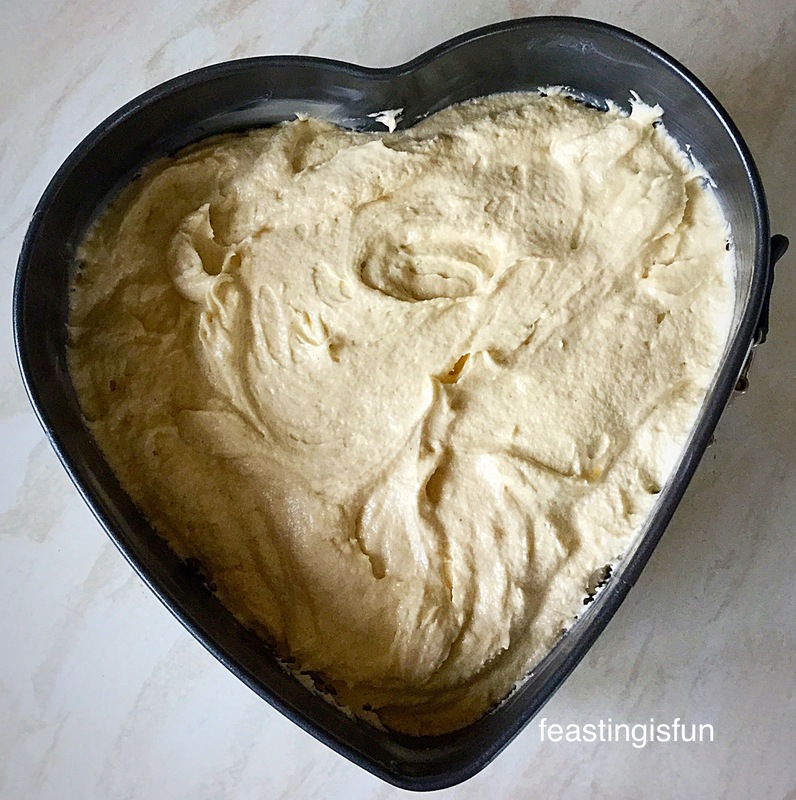 First of all butter and line the base of a heart shaped tin with baking parchment. If the tins are shallow split the mixture, so that it comes half way up your cake tin. Into a large bowl add the butter and sugar. Whisk until pale and fluffy – 5 minutes. Add the vanilla and whisk to combine. Sift the flour, baking powder and salt into another bowl (dry ingredients). Add one third of the dry ingredients and 3 eggs. Repeat using one third of the dry mixture and 3 eggs. Whilst whisking slowly add the final third of the dry mixture. Remove the whisk and give the bowl a thorough mix using a soft spatula, ensuring all the ingredients are well combined. Fill the tin with cake batter and smooth the top. Place the cake tin in the centre of the oven and bake for 1 hour 15 – 30 minutes. The cake is baked when it is golden brown, springs back from a light finger press and an inserted skewer comes out clean. Remove the cake from the oven. Place the cake tin on a large trivet or cooling rack. Allow the cake to cool completely in the tin. Once the cake is completely cold, tip out of the cake tin and place on a cake stand or board, so that the flat bottom is uppermost. Very carefully slice the cake in half. Slice the cake in half. Lay the uppermost half on a spare board. 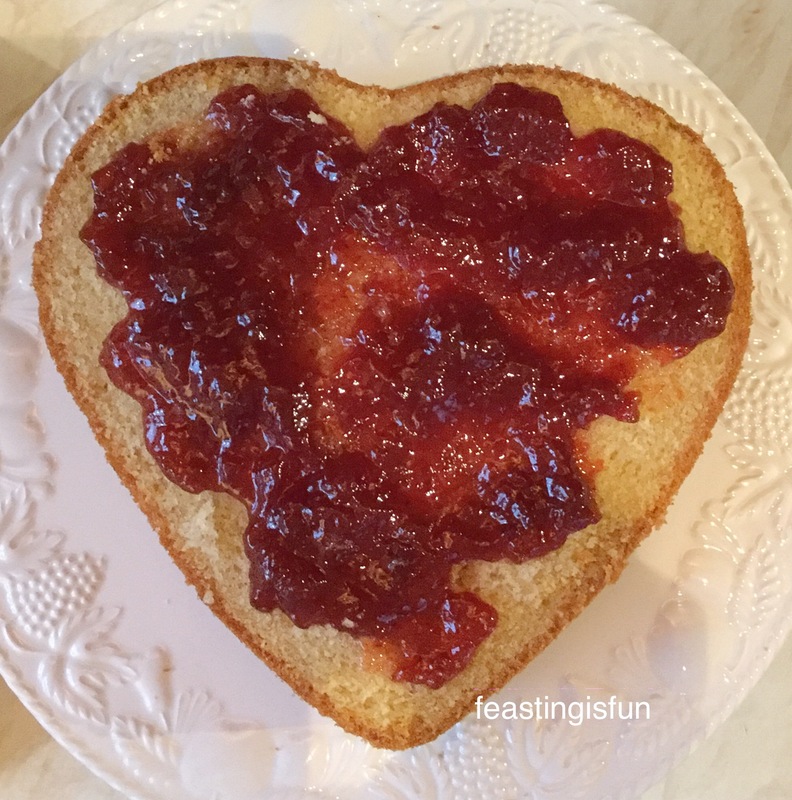 Spread the strawberry jam over the bottom half so that it doesn’t quite reach the edge. Sing a spoon spread jam on to the bottom half of the cake. Lay the top layer onto the jam covered bottom layer. Place the very soft butter into a large bowl. Sift in the flavoured, or plain, icing sugar into the bowl and add 2 tablespoons of boiling water (add 1 teaspoon of vanilla extract, or th required amount of flavouring, if not using flavoured icing). Starting slowly, whisk the ingredients together, increasing the speed as the icing sugar becomes fully incorporated. Continue whisking for 5 minutes, this will ensure the icing is smooth and light. Fit a large icing bag with a large star tip. Finally, fill the icing bag with whpiped buttercream. 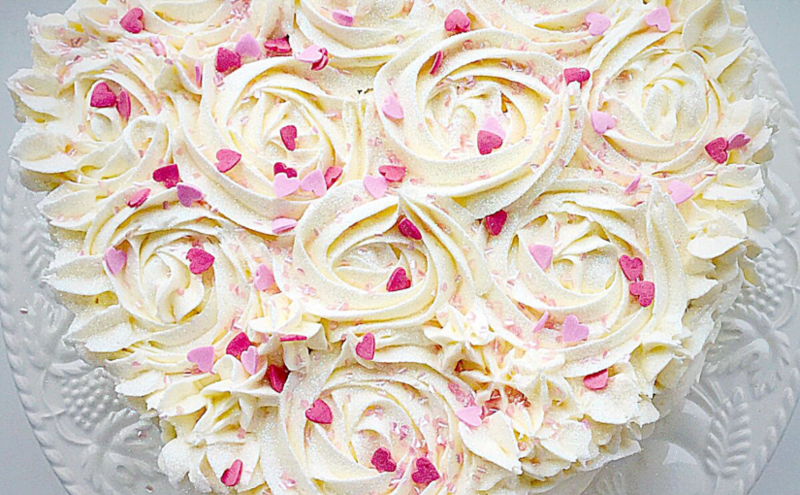 Start with the surface of the cake and pipe a rose swirl at the top, where the dip in the heart is. Continue piping rose swirls symmetrically, either side, of the heart. Finish with a rose swirl at the bottom point of the heart. For the sides, start at the top of the heart bump, on one side and pipe rose swirls around one side and then the other, leaving the bottom point. Go back to the top of the heart and pipe one rose in the heart dip and and additional rose to fill in between the two roses. Now pipe a rose swirl on the bottom point of the heart. Pipes stars wherever there are gaps and visible pieces of cake on the top and sides, trying to keep the pattern symmetrical – especially on the top of the cake. Also pipe stars on the top of the cake around the heart outline. 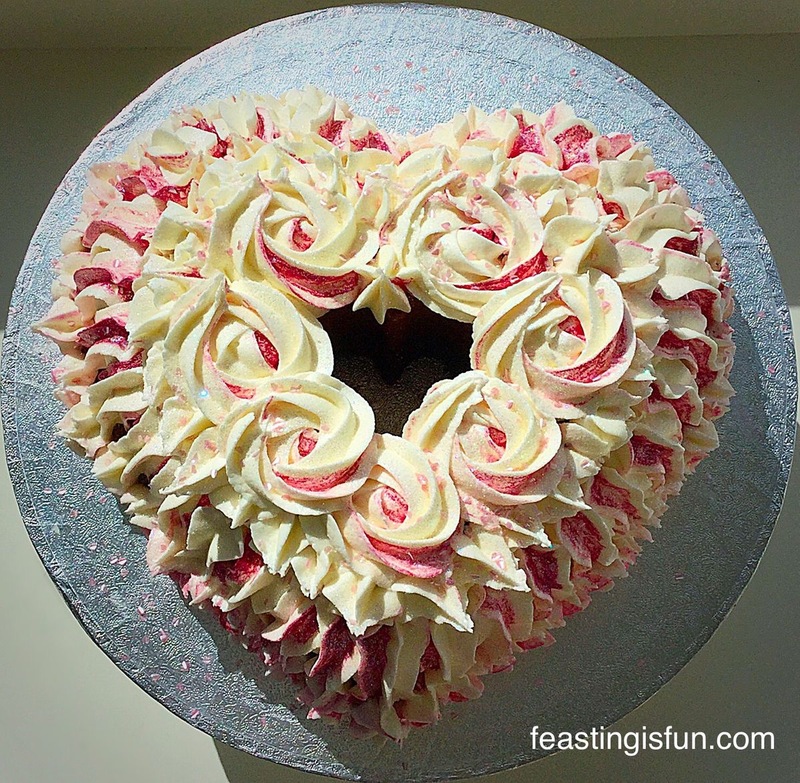 A beautifully covered Strawberry Sweetheart Cake. Now you can sprinkle away. I firstly gave this beautiful cake a good dusting of white edible glitter and then sprinkled two different styles of hearts over it. Strawberry Sweetheart Cake shimmering and sparkling in the sunshine. Place the cake somewhere cool to set for a couple of hours. This cake spent the night in our porch, since it was particularly chilly February evening. Because of the addition of boiling water into the buttercream mixture, this buttercream will not develop a hard crust. 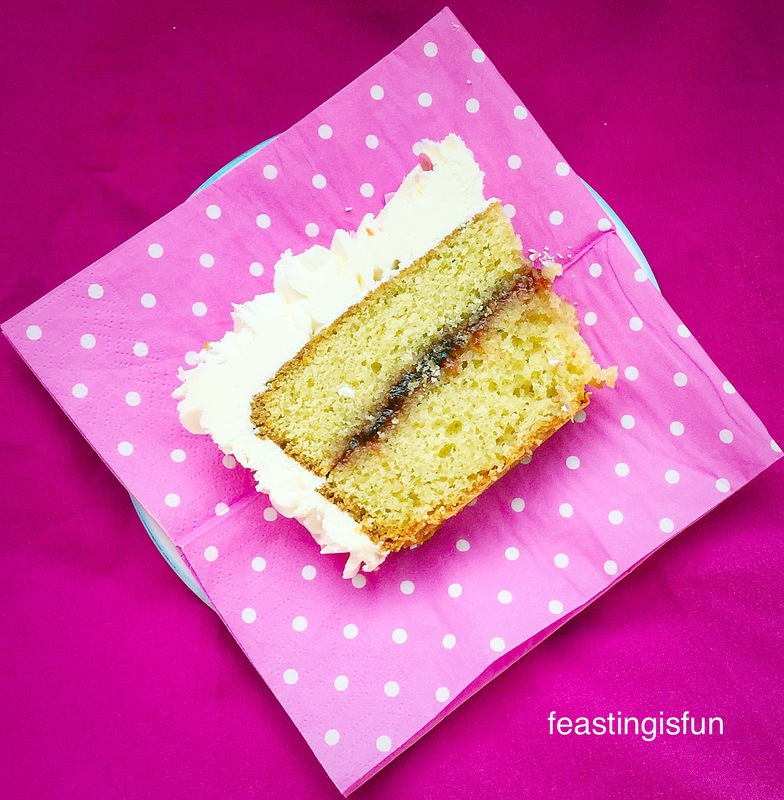 As this not only improves the texture whilst eating the cake, but also means that the buttercream is a dream to slice through! Strawberry Sweetheart Cake one delicious slice – that didn’t last long!!! 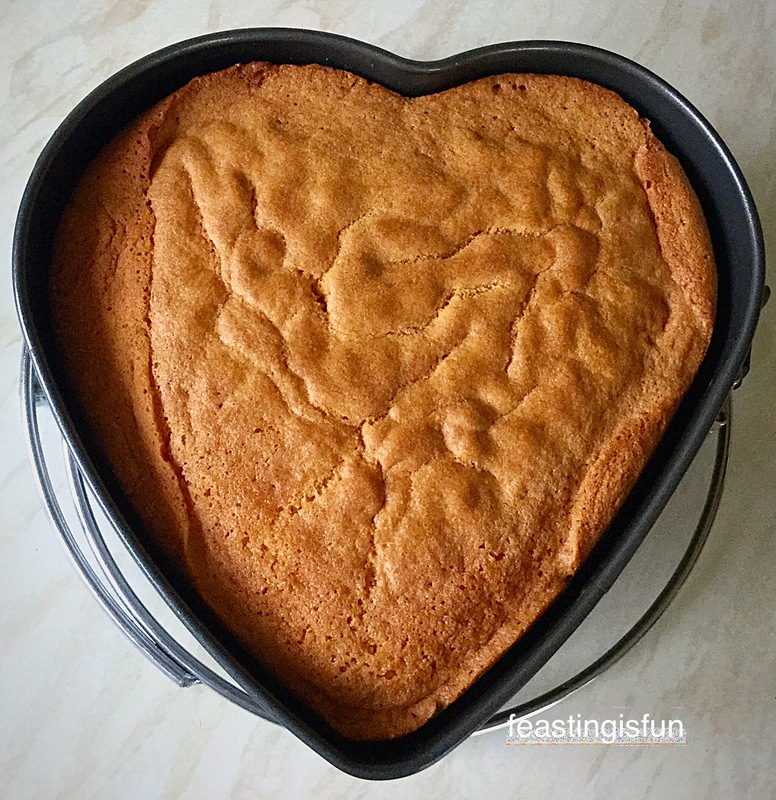 This Strawberry Sweetheart Cake will keep in an airtight container, for up to 5 days, if left somewhere cool – I would advise keeping it in the fridge during the summer. Although having just eaten a slice, I can’t imagine this cake hanging around for long, especially in our house!! 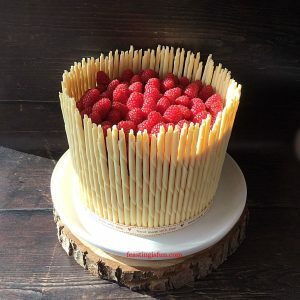 Because making this cake is so beautifully easy, it would be perfect for birthdays, engagements, anniversaries and maybe even small weddings. You can easily tint the buttercream with food colouring. I used Sugarflair and Wilton edible food colouring gels. You really only need a tiny (tip of a cocktail stick) amount to produce a beautiful pastel shade. Whatever you are doing, whether alone or with others, I hope that you know you are loved, see Important Stuff. While I love baking, I also recognise that I am not the world’s best cake decorator. Yet with a little practice I have perfected, the very “on trend” piped rose technique. There is truth in the saying “A little practise goes a long way.” Especially when seeing the finished results and the delight on the recipient’s face when presented with a stunning cake. Most importantly for me is the love that goes into making, baking and decorating a cake. No part of this post may be reproduced or duplicated without the written permission of the owner. Please see my Disclosure Policy. 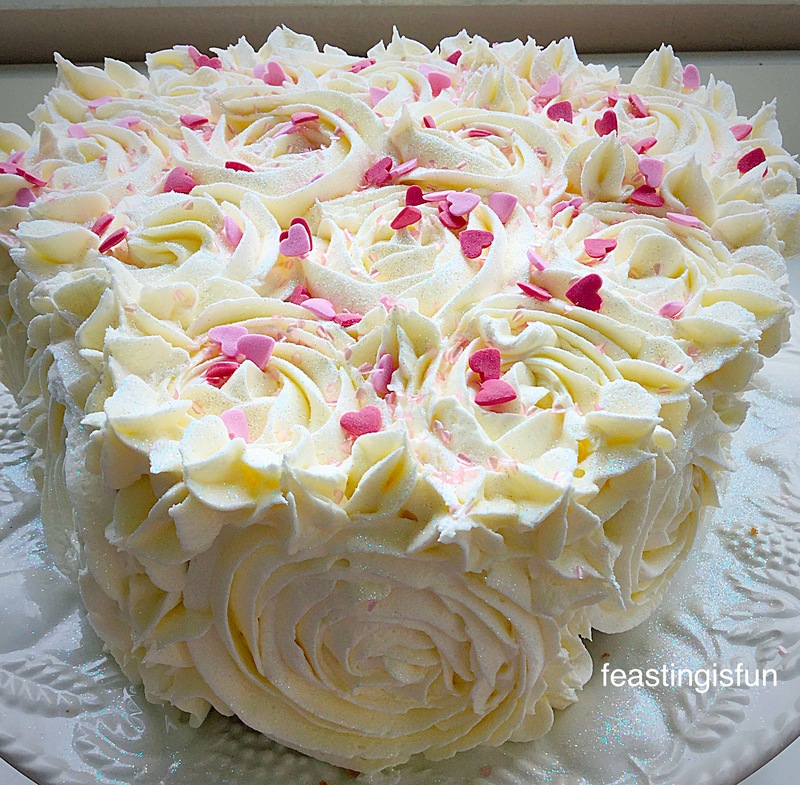 An absolutely beautiful cake Sammie and what a special way to celebrate Valentine’s Day! Love the tip about piping the letter “e” to make the roses! Ah Bea thank you so much for your wonderful comment. You have really lifted me with your words. I’m sure that you will pipe and decorate this cake beautifully. This was the first cake I had every fully Iced! If you need any support just tweet me. Large open star tip, start piping an e and keep going round.